I have found that the more I learn about the human body, nutrition, the history of natural medicine, indigenous as well as modern interpretations, the use of diet, plants that heal and allopathic medicine, that as individuals you are so very capable of looking after yourselves. I have also noticed that turning in may give you the answers you have been looking out for. As I travel this path, I am weaving the knowledge into my practice and what I teach so that the teachings are a more wholistic version of the ancient practice of yoga. As yoga is often aligned with Ayurveda it stands to reason that the teachings would be integrated into the practice, and in some areas there is a natural alignment in the philosophies of yoga and Ayurvedic medicine. However, I feel that wherever you live in the world, you are still learning ways of integrating a healing system that is true to your lifestyle, weather, food options, plant life etc. Not that other cultures haven't taught us anything, they have, and one of the pearls is that, as individual as you are, so is your healing and your way of being. The world is so very multi cultural that not one way will work for everyone and looking back to your ancestors and the blend that has occurred for many may hold some valuable keys to your health care. Look back into your history, see where your ancestors came from and look at their diets, lifestyle etc and see if there is any connection to what ails you and what you might be lacking. Your gene pool isn’t definitive and doesn’t mean that just because your mother, sister, brother, grandfather had a disease that you will naturally follow that path. There is much evidence to say that the lifestyle that you choose will make more of a difference. Your food choices, whether you smoke, drink alcohol, how often you exercise, if at all. Where you live can also have an impact on your health, however I believe a huge part of your propensity to be well or not is in your attitude and of course moving your body and clearing your mind, breathing well, eating fresh whole foods, staying away from medications and only using them as stop gap measures until you find a way of helping your body correct itself. So here is where yoga drops quietly back into play. Yoga can help move the stuck energy in your body. It supports the systems of the body and helps integration of many aspects of being. The lymph and immune systems, nervous system, circulation, respiration, digestion and motility of the gut, spinal health….the list goes on. And let me not forget to mention mental health, yoga helps you adjust your attitude and will remind you to be grateful for all that is good and right in your life and accept all that life teaches you through hardship and adversity. Yoga helps you to be thankful for the wonderful people that fill up the spaces in between your next visit with self on the mat or off, depends on how seriously you take your practice. 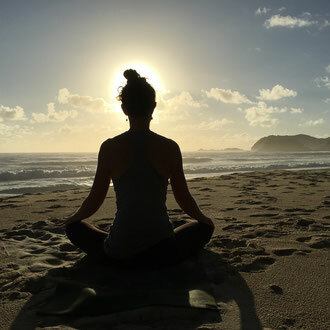 Yoga also provides you the opportunity to have a quiet and personal relationship with yourSELF, time for reflection during meditation and relaxation, time to empty the dross and make room for the newness that is just waiting to get in. Yoga can also provide you a spiritual haven that is lacking for many. Religion is often regarded with disappointment and disillusion leaving many lost. Spirituality can fill that void and yoga may provide you with a way of looking at spirituality, giving an actual experience rather than just reading or being told what is. Yoga does not mean eastern religion, however you can learn a lot from the eastern teachings, frankly you can learn a lot from many of the religious teachings world wide. You do not however have to follow like sheep, you can turn in and take the time to listen to your higher wisdom.